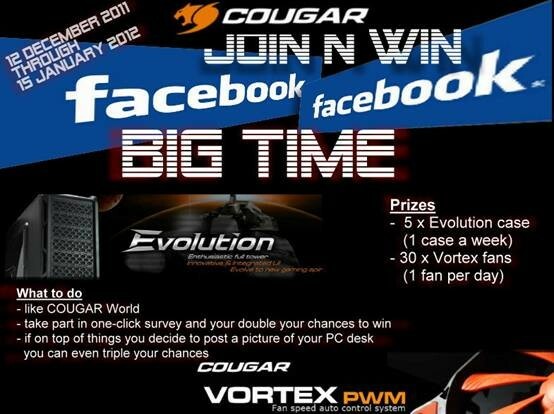 COUGAR, brand manufacturer of high-end PC cases and cooling fans, is finally celebrating their newly established Facebook presence. Join and enter the global giveaway, it has never been easier to get a high-end COUGAR EVOLUTION PC case or one of their high-efficiency Vortex cooling fans. Getting ready for the Holiday season and the big countdown into the year 2012. Therefore, COUGAR will be giving away attractive prizes on each and every day for the next four weeks, in order to get you well armored for your gameplay throughout the next year. 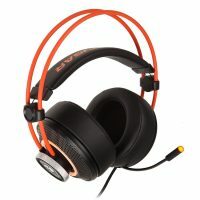 With its spacious interior offering enough room for 8 PCI cards, providing sufficient flexibility for multiple graphics solutions and up to 7 fans equipped with a unique dual-fan-set management system, the COUGAR Evolution sports excellent cooling and ventilation characteristics that are the ideal foundation for a professional gaming system packed with high-end hardware. The new and exclusive COUGAR VORTEX 120/140mm fans, with their uniquely designed high-vortex-airflow turbine blade and enhanced frame design provide optimum cooling efficiency which in turn leads to a reduction of the fan speed and extremely quiet operation. In addition the advanced HDB (Hydro-Dynamic Bearing) not only minimizes potential noise even further but also prolongs its effective best lifespan.